The guided-missile destroyer USS Fitzgerald (DDG-62) has arrived in Mississippi ahead of repairs that were the result of a fatal collision with a merchant ship in June, the Navy announced on Friday. The destroyer departed Yokosuka, Japan in late November lashed to the deck of the heavy-lift transport M/V Transshelf. The transport transited the Pacific and arrived at the U.S. Gulf Coast via the Panama Canal, according to Naval Sea Systems Command. 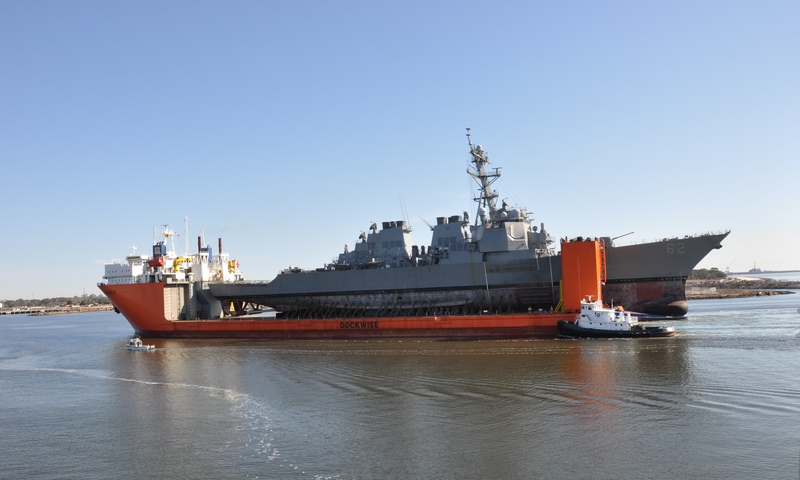 “Fitzgerald is expected to spend several days in the Port of Pascagoula as the heavy lift ship will commence the reverse operation of unfastening, lowering and guiding the ship off the platform. The ship will then be taken to its designated pier space at Huntington Ingalls Industries shipyard,” read a statement from NAVSEA. The process to restore Fitzgerald is expected to take two years. The collision with the merchant ship ACX Crystal resulted in extensive damage to the ship below the water line and the superstructure. In total, the final cost for the repair for Fitzgerald is estimated to run about $367 million, according to a Navy cost estimate obtained by USNI News. Seven sailors died in the collision. The following is the complete statement on the arrival of Fitzgerald to Mississippi. WASHINGTON (NNS) — The Arleigh Burke-class guided missile destroyer USS Fitzgerald (DDG 62) arrived in Pascagoula, Mississippi, Jan. 19, aboard heavy lift vessel MV Transshelf inward bound from Yokosuka, Japan. Fitzgerald was involved in a collision with the Philippine-flagged ACX Crystal June 17. Seven Sailors lost their lives and the ship was damaged on the starboard side above and below the waterline. The Navy released a comprehensive review of the incident Nov. 1.